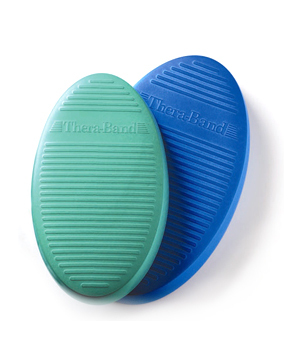 Thera Band Stability Trainers are oval-shaped, color-coded pads, supplied in three densities to provide a progressive system of balance training for rehab, post-rehab conditioning, and fitness applications. Green (firm) and blue (soft) pads are molded in closed-cell foam with a ridged surface. By combining the different pads and using the sets of 2, patients can improve balance and proprioceptive skills by progressing through levels. The Blue Pad measures 16" x 9" x 2" on the top, and 17" x 10" x 2" on the bottom. The Green Pad measures 14.5" x 8" x 1.75" on the top, and 15" x 8.75" x 1.75" on the bottom.